Wink doing what she liked best grubbing in the mud!! Wink was born in Somerset and came over to Ireland in 1999 with her mother, father and sister. Wink had every reason not to be with us, because when she was born she weighed only 185 grams (6½ ounces), but, typical of her spirit, she pulled through and has rewarded us time and time again - she was a very, very special dog. All of our kennel names have the first letters of the dam and sire so in Wink's case this was S for Sassie and Q for Quillan her 'Semi Quaver' seemed so right for her! Wink 'bubbled' from waking to going to bed and was the first to play and chase. She brought laughter into our lives and we are going to miss her greatly. Wink only grew to the bottom of the 'standard' height - however as a puppy she won BP at the prestigious 'St Patrick's Day' show in Dublin and has won two Reserve Green Stars at Championship shows. 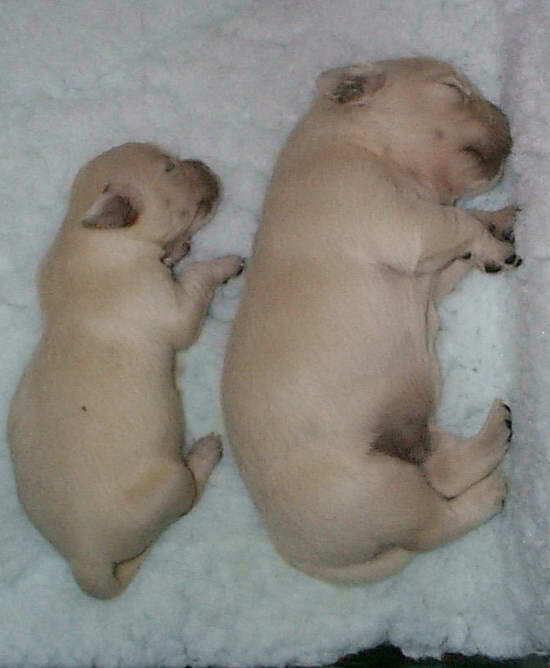 This is Wink photographed at 10 days of age alongside her sister Sofie - Wink was only half the size - but twice the character! She rests under the apple trees alongside her mother, father and uncle Harry. Sleep well lovely girl we will always miss you but never forget you, you will always be our bright star!